I was looking for salary survey information for some research and just realize that the latest figures won’t be available until first quarter next year. While surfing the two main industry certification bodies, namely The UK-based Chartered Institute of Purchasing & Supply (CIPS), and US-based Institute for Supply Management (ISM), I come across some interesting facts of the year 2009. I know and I have been advocating all along that the procurement profession has undergone a major transformation over the last few years. However I am still quite shocked to read from the CIPS – Croner Reward salary survey (conducted between October and December 2009) that procurement and supply professionals get paid more than peers in marketing, finance, IT and human resources in graduate careers. Salaries obviously reflect experience, qualifications and ability, so graduates entering the profession need to prove themselves by showing a willingness to learn, independent thinking and determination. This is definitely great news for us to recruit graduates into the profession. In terms of experienced procurement professionals, the ISM 2010 Salary Survey (covering 2009 data) shows average salaries by titles range from US$50,506 for entry level positions to US$240,408 for chief procurement officers. Total average annual compensation is US$98,200, and 34% of respondents reported earning a salary of US$100,000 or more. The reported high salary was US$620,000 for the men and US$690,000 for the women. Bonuses are already included in these figures. I know, salaries shouldn’t be the only luring factor for graduates, but I truly believe that it has to be appropriately measured up against the value and results we deliver. There is never any excuse for corruption or bribery activities, but face it, the likelihood of that happening is higher with underpaid procurement professionals. As covered in my pervious posts, we should always uphold the highest level of integrity at all times. 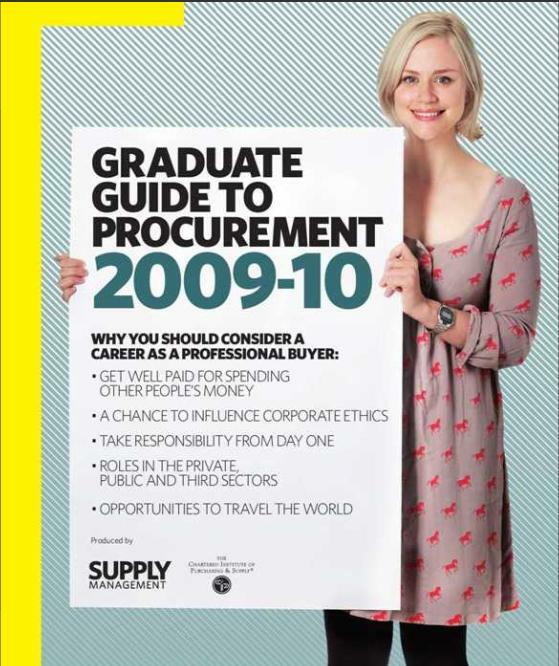 On the same CIPS site I discover a fabulous Graduate Guide to Procurement, aimed at introducing what procurement is to graduates. It provides a wealth of information including industry 101, salaries, environment, industry outlook, job hunting, CV writing, personality tests, and a number of corporate case studies including British Airways, Rolls-Royce, Starbucks and Apple. Highly recommended even for those who are just interested in knowing what we do for a living!